Over the years, chair designs have changed. But where other chair makers left off, the Vert picks up to deliver the supportive seated experience you've always wanted in an office chair, but for much less than you'd expect to get it. Get ready to enjoy a whole host of ergo-friendly features, such as a back that was designed to mimic the spine throughout a wide range of movements, from typing and swiping to twisting to hear your colleague in the back during meetings. Supportive soft-touch armrests adjust higher or lower, as does the chair's lumbar support, so you can fine-tune the chair to your liking until it's just right. Thanks to a weight-sensitive mechanism in the back, reclining is seamless and done without locks or levers. Eco-friendly and up to 62% recyclable, you'll have a chair that's as good for the environment as it is for you. Engage in better seating with the Vert Ergonomic Chair by UPLIFT Desk. Seat height 15.7" - 19.7"
What sets the Vert apart from other ergonomic chairs on the market? If you work in a job that requires you to sit for a majority of the day, the Vert Ergonomic Office Chair by UPLIFT Desk is here to help you sit with more support! The Vert boasts all of ergonomic features you'd want, like adjustable lumbar support, a flexing mesh back, and even comes with a headrest. 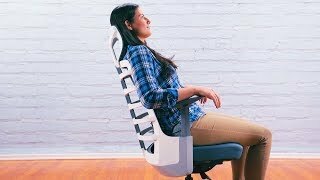 But what sets this apart from other chairs is it offers you all of these features at a much lower cost, so your ergonomic dollar stretches further, so to speak. How is the Vert different from other chairs by UPLIFT Desk? The Vert Ergonomic Chair was designed with a flexible back that twists to mimic the natural curve of the user's spine. This provides steadfast support along the entire back and lumbar region, more so than previous chairs. You'll also enjoy being able to adjust your seat depth and height, so it's more adjustable to you. You'll also get the seat in supportive fabric and a mesh back, which is perfect for long-term sitting sessions or environments that get hot. If you have any questions about which ergonomic chair is right for you, check out our chair comparison chart for an easy breakdown of all of the features! What makes the Vert so ergonomic? The Vert Ergonomic Office Chair was designed to deliver users a supremely ergonomic sitting experience. Every feature UPLIFT Desk included on the chair is there to amplify your comfort levels, from the 5-star base to the height-adjustable armrests, to the back-hugging spine. We think you'll agree, it's a great ergonomic chair for the price! Does this chair have a mesh seat? The Vert comes with a plush seat cushion, which is paired with a mesh back to offer ideal support and circulation. If you're on the hunt for an all-mesh chair, we recommend the Pursuit Ergonomic Chair! How does the Vert compare to the Pursuit? We love the Pursuit Chair by UPLIFT Desk thanks to its unique breathable mesh back and seat, height adjustable armrests, and headrest that offers the utmost in support for your head and neck! Compared to the Pursuit, the Vert comes with a slightly different back, which features a design that flexes with your spine as you switch postures throughout the day. Also, the seat pan on the Vert is adjustable, while the Pursuit's seat pan is not. If you're having a tough time deciding which chair is right for you, please call our Sales Pros and we'll be happy to help point you in the right direction. Can I remove the Vert's headrest? After assembly, the headrest on the Vert remains fixed. You can choose to remove it completely or not add it on during the chair's initial assembly if you'd like, but there will be two holes where the headrest was installed before. If you're interested in an ergonomic chair with a removable headrest, try our J3 Ergonomic Chair out for a chair that give you freedom to adjust and move until you're comfy in all the right places. Does this come with a contoured seat? Yes, the Vert Ergonomic Office Chair's seat cushion is lightly contoured. The Vert supports up to 250 pounds, so this means it works for a large majority of the population. If you have any questions, feel free to call us and we can help you determine if this chair is the right for you. Why does this chair have a mesh back? We love mesh because it allows you get better airflow to your back, so you can work comfortably, even in warm and humid environments, with little issue. The Vert Ergonomic Office Chair by UPLIFT Desk is available in black or white. The centerpiece of this chair is the unique, spine-like back that will twist as you twist. The white model features a white back, gray armrests, and a matte silver base. The black version of the chair features a black backrest, gray armrests, and a polished silver base. Both models have a dark gray mesh seat back. $399.00 List Price: $499.00* The list price is the same as the MSRP (Manufacturer's Suggested Retail Price). It may not necessarily be the price at which the product is sold.